Fire HD 10 vs Fire HD 8 – Heavyweight Battle of the Kindle Fire HD 10 vs Fire HD 8 Tablets. One might say that the Kindle Fire HD 8 should not be pitted against the Fire HD 10. While both Android ereader devices were launched in 2017 and considered as 7th generation Kindle Fires, the Kindle Fire HD 10 is clearly a higher version of the HD 8. The HD 10 even costs almost twice the price of the latter to begin with. As such, it is expected that the HD 10 has more bells and whistles versus the HD 8. Nonetheless, the latter Kindle has some features that are not available in its more expensive sibling. And besides, each user may have his own preferences, such that he would probably like All-New Fire HD 8 Table more than the Fire HD 10 . In any case, both Fire devices have a number of similarities. For one, they run on the same Amazon Fire operating system instead of the usual Android program. Also, these Kindle Fires are expandable via MicroSd, free cloud storage for any Amazon content and an access to Alexa. And it’s good that these tablets are relatively affordable and could perhaps offer the best value for your money. But, you might ask, which one is for you? I’ll discuss each of the Fire tablet’s advantages Fire HD 10 vs Fire HD 8 on one another as well as its disadvantages which will make you choose the other Fire device. It has a bigger LCD Screen at 10.1 inches compared to 8 inches of the HD 8, which is beneficial when watching videos. Dimensions of the whole device are also much larger. Comes at a minimum storage of 32 GB and an option for 64 GB. Faster with a quad core processor at 1.6GHz and 2 GB RAM. This means quite a significant difference in terms of performance. It has a denser display with sharper resolution, capable of playing full HD at 1080 pixels. Offers a much clearer audio with Dolby stereo speakers. Can access Alexa hands-free. You can shout commands from across the room just like you would with an Amazon echo dot. Its warranty covers one full year for more security. Can serve as a mobile hotspot when you need emergency internet connection for another device. Its smaller overall size is more handy and portable. It is a lot cheaper with a base price of only 50 dollars, perfect for the budget-conscious buyer. The front camera quality is a lot better compared to the VGA resolution on the HD 10. It has a lighter weight of only 12 ounces. Battery lasts longer at 12 hours. It is heavier at about 15 ounces given that it is a larger device. It might not be much but, when you bring it when you travel, every gram counts. More expensive, about twice the cost of the HD 8. The user cannot access Alexa hands free and can only do so by pressing its home button. The warranty it comes with covers a shorter period at 90 days. It has about the same thickness as the HD 10 but, deemed thicker based on its smaller size. Although it is pricier (and for good reason), I would personally choose the Kindle Fire HD 10. It is more well-rounded and versatile. The resolution quality gives it a better edge than the Fire HD 8, especially when you like to watch videos on the device. While it has a better audio, the speaker sounds still leave much to be desired. Bluetooth connectivity is available so it is best to make use of it or go for the headphones. Further, don’t expect too much on the 2 megapixel camera- quality is dismal. But, the fact that it has one, should be sufficient. When you’re using a smaller font, the text is still readable compared to the HD 8. And it operates smoothly and does not hang as frequent as the other model. The overall experience is just a lot better with the HD 10. The Kindle Fire HD 8 is not a bad option at all. If you have an echo dot device already and prefer watching videos on your much larger LED TV, then this could very well fit you. And it has an unbeatable price that gives you both an ereader and a mobile tablet in one nifty device. I have also tested the much earlier Fire HD 7, and I tell you that the HD is a big improvement. Ultimately, though, the Kindle Fire HD 10 does it for me. 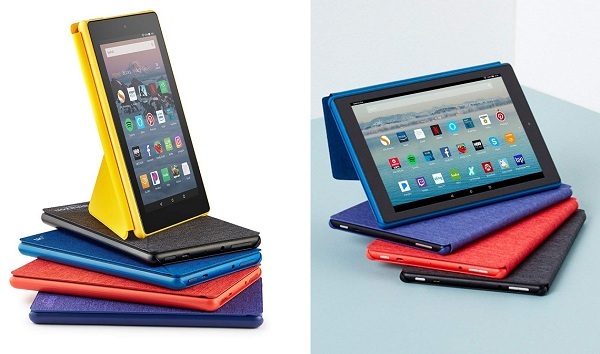 Thanks for reading our Fire HD 10 vs Fire HD 8 review.